There are many ways to get Gold in Tera, which is both boring and fun. 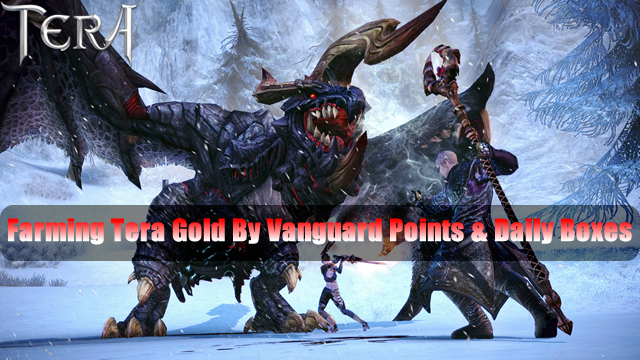 So let me list two ways (Vanguard Points & Daily Boxes) to get Tera gold for you. If you have a lot of Tera gold, then you can buy equipment, materials, etc. to help your classes stand out! In TERA, its Vanguard Request System has been proven to be extremely easy to use, convenient, and effective. Let's take a look! This is slightly derivative. But winning battlegrounds fulfills a player’s daily vanguard quest. By winning in PvP a player can net a large number of vanguard points, flat gold, and feedstock. This is especially true for the players that can win Corsair’s Stronghold multiple times. Winning a battleground itself (or losing) will grant Bellicarium and Killing Spree credits. A player earns a lot more upon winning of course. These points are mostly used for crafting PvP gear. However, you can use the Killing Spree credits to buy Fine Niveots to sell on the broker. The conversion rate is, quite frankly, terrible. It is an option, however. Red Fine Niveots sell for an average of 900g on the broker. But since it costs 20k Killing Spree credits it is not an incredibly viable option. Daily Boxes - Now this is where the real money comes in. Every day, each character has 3 available boxes he/she can receive for winning in battlegrounds. Corsair’s Stronghold is a 20v20 attack/defense equalized battleground. It is based on protecting one’s anchorstone against the other team for one phase. Then replaying the same map whilst swapping roles with the other team. On average, the match time is 25 minutes. In comparison to the existing battlegrounds, in the Gridiron you needn't worry about your group, listen to orders from your leader or follow any special strategy. The only thing that counts here is the points tally! Gridiron is a 15v15 unequalized battleground where the objective is to get 70 kills total for your team within an arena. Players that are not so good at PvP are advised to use the “Suicide Soldier” pylons to become bombs to bumrush the enemy. It's a good way to catch groups of enemies of the guard and net free points for your team. Average match time is 12 minutes. Kumaslyum is a 3v10 unequalized battleground where three players become bams, Kumas to be specific, they will have the traditional Kuma moves. The objective for the 10 players is to steal 3 Kuma candies hidden in chests around the map. The Kumas, aware of the location of the candies, must stop them. Whoever controls the most candies at the end of the match wins. Players should note that this battleground gives the least in terms of vanguard daily rewards. Average match time is 12 minutes. The boxes easily sell on the trade broker. They can, however, open them for the potential for greater rewards. Some notable rewards include 10 inferno ores which can be sold at 100g each for a total of 1k gold or crowning laurels that can sell for a couple thousand. In my opinion, it is much safer to sell the boxes themselves. To maximize profit. A player might want to consider running multiple characters and pick up more than the max amount of daily chests. If he/she is time efficient and wins a lot of PvP, 3 characters for 3 boxes each would give the player 3.6k gold alone, not including vanguard rewards. Quite a hefty bit of profit for some boxes. PvP is a great way of making a profit over time. My recommendation is to use your main PvP character to get all 3 daily boxes and sell them.